Special Thanks to: colinross, Egghebrecht, Flummoxer, Kuittaa, Magic Star94, Me-Bomb, Micael Fatia, Prashanna, Roy, Simple013, Tabt, TakerMayFire, Thomas154321, ZE PINKLETON! 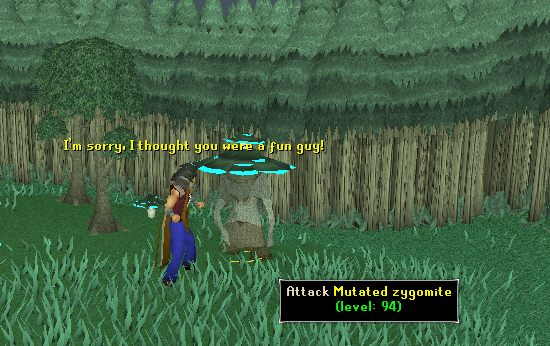 The Lost City of Zanaris is a members only area which can only be accessed after completing the Lost City Quest. 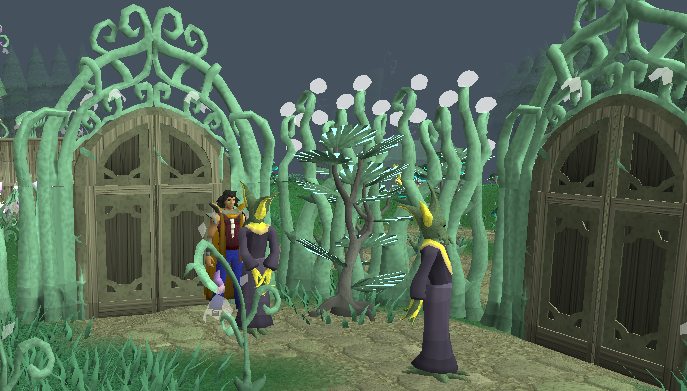 To enter the city you must enter the shed in the middle of the Lumbridge Swamps wielding either a Dramen or Lunar Staff. 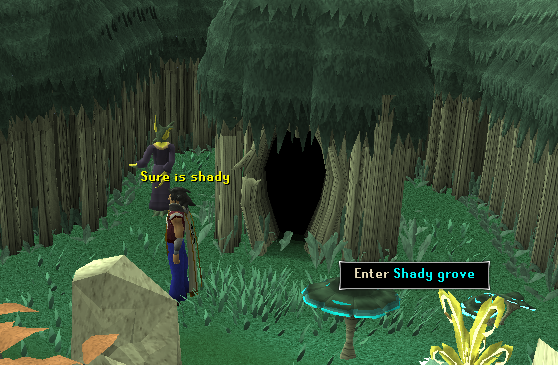 The quickest ways to get to the shed are teleporting to Lumbridge and squeezing through the gap in the fence in the churchyard, then making your way to the shed or teleporting to Draynor Village and walking/running from there. 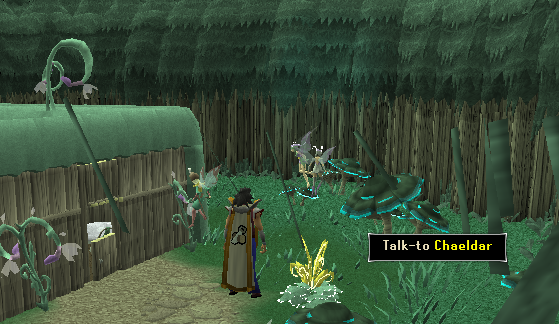 If you enter the shed without wielding a Dramen or Lunar Staff then you will just walk into the shed, and not go to the city. There is lots to do in this city including slaying monsters, crafting Runes and making Flour! When you enter the city from the shed you will appear standing in the middle of a Fairy Ring in the north part of the city with almost even amounts of ground to both your east and your west. To the north of you there will be an Egg that automatically spawns there. 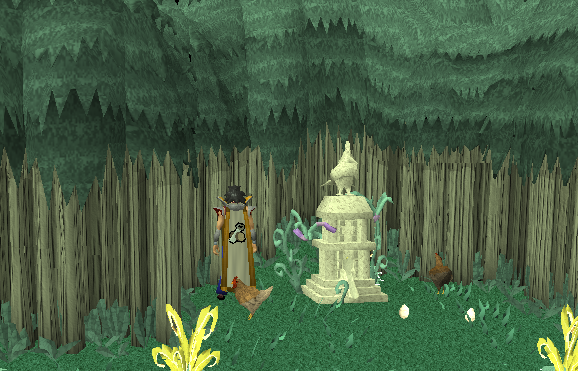 Behind this egg there is a shrine to the Evil Chicken. When you use a Raw Chicken on this shrine, you will go to the Evil Chicken's Lair. If you don't want to head into an area full of Black Dragons, you can head south instead. 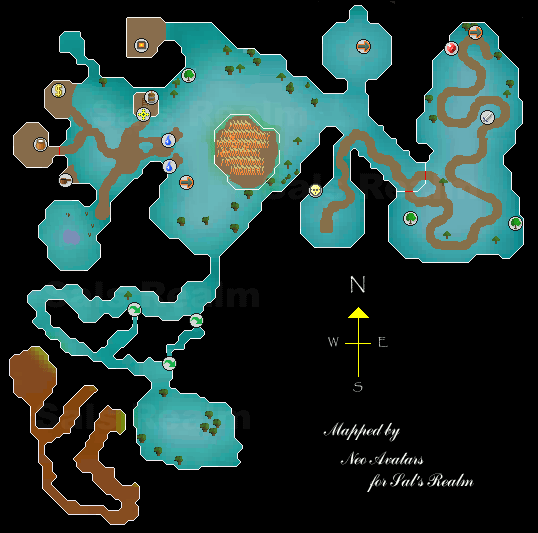 By going across the main corridor and carrying on south from where you appear, you will come to a room with one of the Slayer Masters in. This Slayer Master is Chaeldar, and you must have 70 combat to be able to get an assignment from her. You can also trade her and buy all the basic Slayer equipment. There are also other NPCs within this room who feature with quests like Fairy Tale Part 1: Growing Pains and Fairy Tale Part 2: Cure a Queen, but aren't much use outside these quests. After completing Fairy Tale Part 2 there will be Orks wandering around the city. They don't do much other than groan and get in the way, but make the city special! Once you've had enough of this room, you can head back north to the crossroad, turn left and start heading west. One of the first things that you should notice when walking in this direction are some cows. 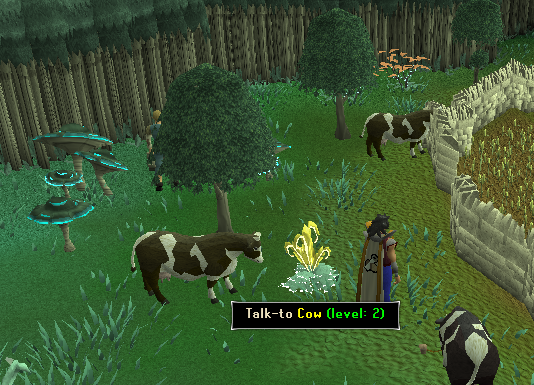 Unlike normal Cows that can be found above ground, these can talk! To the south of these cows there is a sandpit that can be used to fill buckets with sand to make things like Glass. To the west of the sandpit is a large field of Wheat. You can pick the wheat to be used in a different area of the city. From the Wheat Field head north, then west when you reach the wall, heading into a room in the very north of the city. 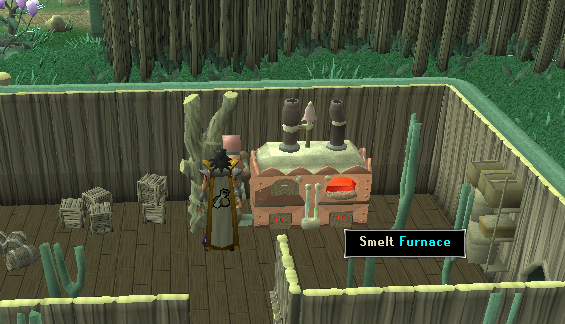 In this room is a furnace which can be used to smelt Ore.
To the south of this room is a special building. Walk round the corner to the east and past a Yew Tree to get to this truly amazing building. 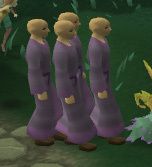 There are others like it throughout Runescape, but nothing quite the same. This building is a Windmill, that's powered by a Cow walking round and round in a wheel! 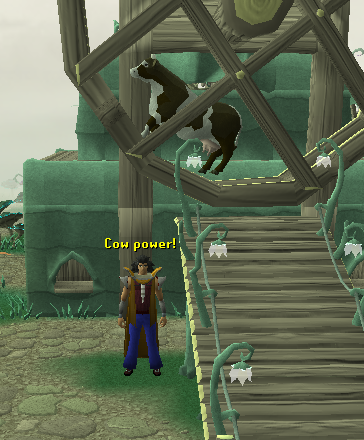 It can be used just like any other windmill in Runescape. Put the Wheat in the hopper at the top, pull the lever, go down to the bottom floor and use a Pot with the container to get a Pot of Flour. Just to the west of the windmill is another spawn. This time it is of a Bucket. To the north of the bucket is another small room. 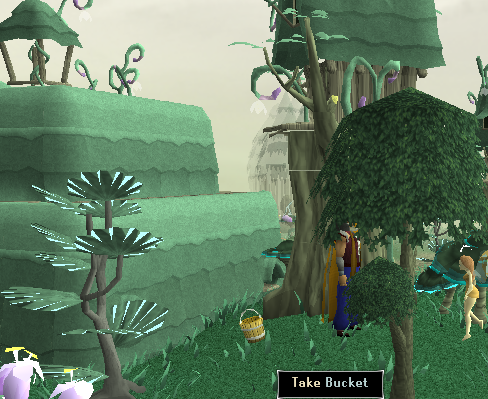 This one is belongs to Fairy Nuff and is used during the Fairy Tale Part 2 Quest. South of this room is the Zanaris Bank. Talk to one of the Bankers to access your bank and deposit or withdraw items at your will. South of the bank is another thing that can be found in almost any city: A General Store. All the normal items sold at a General Store can be found here. Even further south is a room full of a monster that can only be found in Zanaris, Otherworldly Beings. 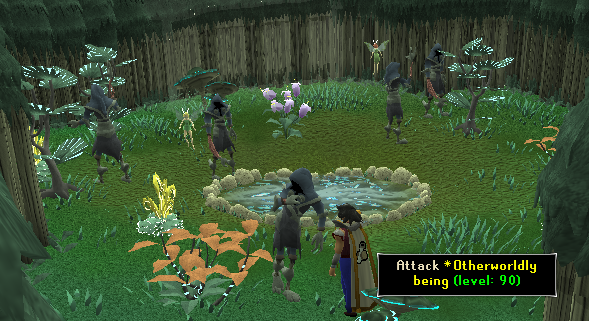 They are level 90 and are not aggressive, making them a good place for mid-level players to train. They can also drop Dragon items like the Spear, Med Helm and Shield Left Half. If you head north from here, and stay against the wall that is on your right, and head past two fountains you will see a Ring just like the one you appeared on when you entered the city. 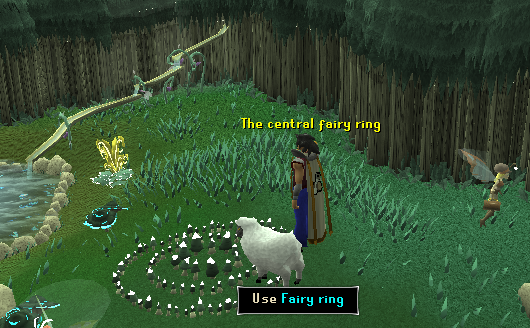 This is one of the Fairy Rings and is a method of making your way around Runescape. South of the Fairy Ring is a narrow passage. 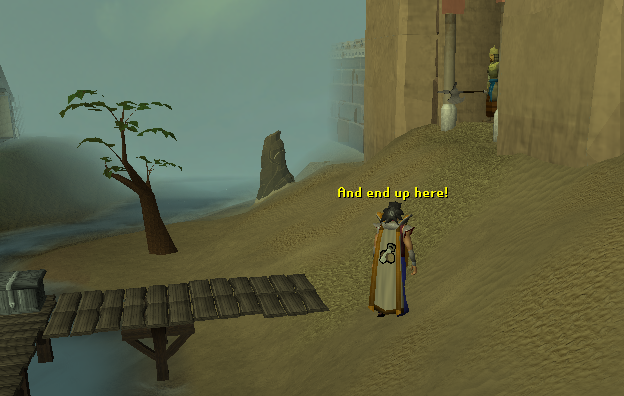 This passage is also long, so there are two Agility shortcuts to make the journey shorter. 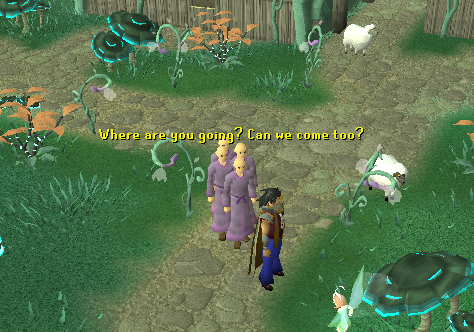 The first one you come to requires 66 Agility to get through, while the second requires level 46. You may be thinking why you want to go down a long passageway. The reason is because the Cosmic Altar can be found at the end of it. To enter these ruins you must either have a Cosmic Talisman in your inventory, or be wearing a Cosmic Tiara. 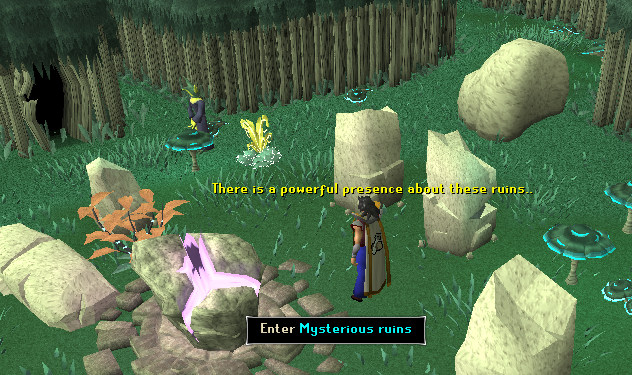 Once inside the altar you can craft your own Cosmic Runes out of Pure Essence! Just to the east of the Cosmic Ruins you will see that there are four dots on the mini-map indicating that there are monsters around, but no monsters to actually kill. 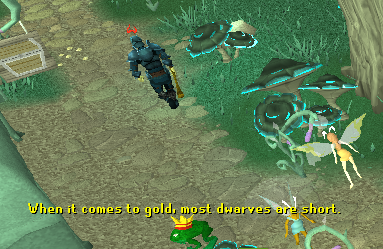 Look around where these monsters should be and you will notice that there are level 94 Fungi that you can pick. If you pick these fungi then they will turn into Zygomites which require level 57 Slayer to kill, and Fungicide Spray to be used with them to make them die, much like using Salt on Rock Slugs. On the west side of the altar you will find a narrow passageway. The area through here is used during the Fairy Tale Part 1 Quest to kill the Tanglefoot and obtain the Magic Secateurs. 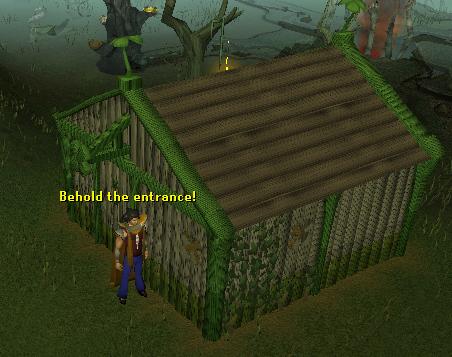 Once you have killed the Tanglefoot, you will still be able to enter, but the only monsters inside will be lots of level 82 Baby Tanglefoot. Once you have explored this area thoroughly, head back to the crossroads that you went past earlier on in the tour of the city and head down the path to the south-east. At the end of this path is the entrance to the Zanaris market. To enter the market you must pay one of the Gate Keepers the trading tax of 1 Cut Diamond. If you ask what the Diamonds are used for, you will be told that they are used to make Fairylights. Once inside the market there is quite a lot to do. To the south there are two Yew Trees that can be cut, and the logs burned. In the northern parts of the market there are a number of shops that give the area the name "market". First is the Dragon Weapon Shop owned by Jakut where you can buy both the Dragon Longsword and the Dragon Dagger. The other shop in the market, owned by Irksol, only sells one item. This is the Ruby Ring. 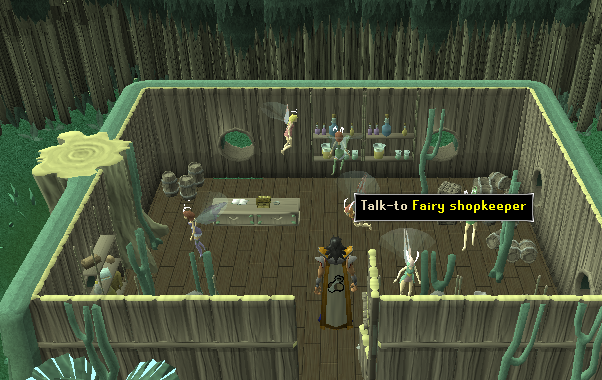 There are two other NPCs within the market that don't own a shop. 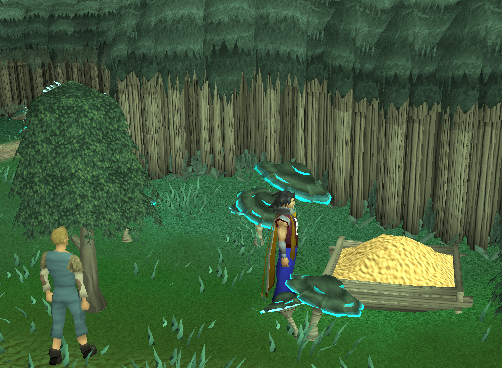 The first is Lunderwin who will buy any Cabbages you have brought with you for 100 gp each. This may sound great, but you can only take 27 Cabbages to sell at a time because she won't buy noted Cabbages, and you can't take sacks into the marketplace due to security risks. The second is called Fairy and can be found next to another Fairy Ring in the north-east corner of the market. 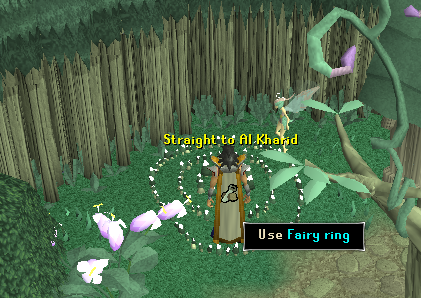 This Fairy Ring only goes in one direction and when you use it you will appear slightly to the west of Al Kharid Bank. 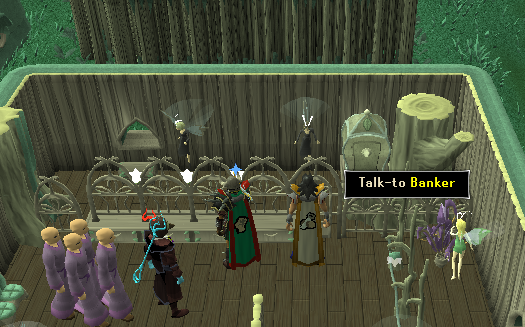 If you wish to leave the marketplace, but not go to Al Kharid then you can go back through the door that you entered the market through without having to pay the price of another Diamond. There are two methods that you can use to leave the city. The first is using a Fairy Ring. 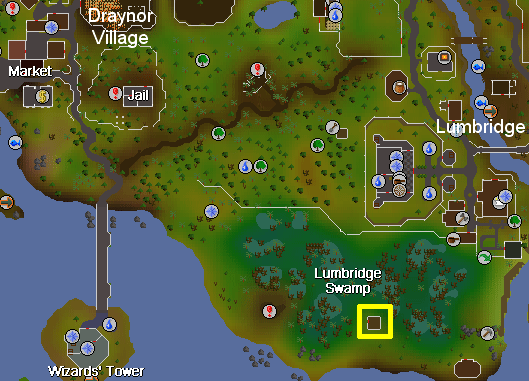 The one that you appear on when you first enter the city will make you appear outside the shed in the Lumbridge swamp, the one in the marketplace will make you appear just west of Al Kharid Bank, and the other one will give you the option to enter a co-ordinate and go to where it takes you. 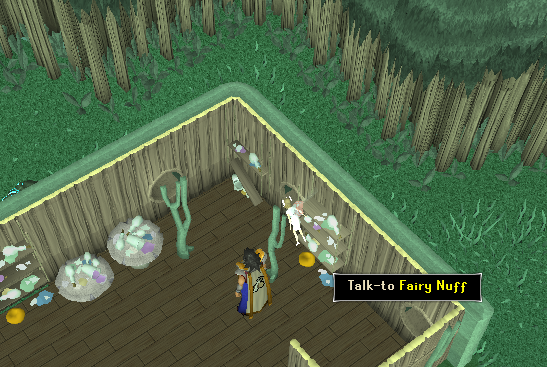 When using the ring in the marketplace, you must talk to the Fairy beside it otherwise it will make you appear outside the shed in the Lumbridge Swamp. The only other way out is teleporting. While in Zanaris there is a change that one of a number of things will happen to you. They are all harmless, but you can't do anything else while in control by the random event. 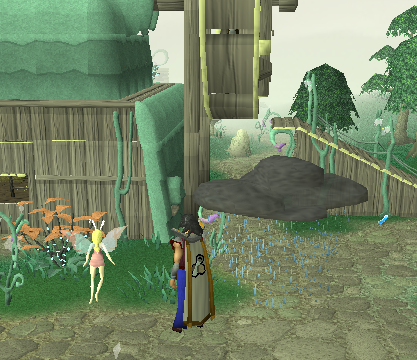 This storm cloud may appear over any unlucky visitors of Zanaris, so don't forget to bring your umbrella! You may get wet from this cloud, so make sure you know where the nearest clothes press is to dry out everything you are carrying. 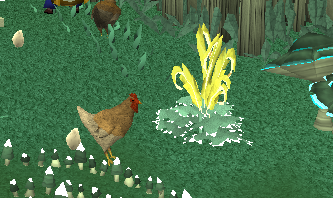 At any time, you may morph into a chicken for a few seconds... don't worry, you will transform back (if you're lucky)! 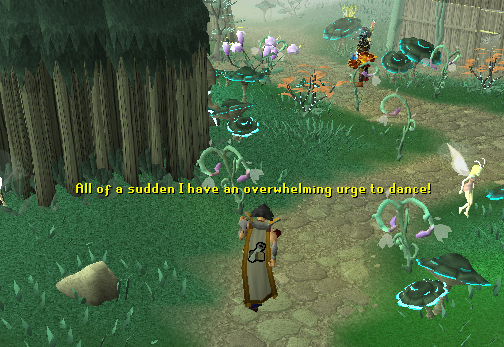 Your character might all of a sudden get an urge to dance, and will dance automatically. Yes, it is kind of embarrassing, but you can't do anything about it. Just like morphing into a chicken, you may suddenly morph into a little piglet! Don't worry, you will be transformed back. A frog may appear next to you and say something, and your character will reply with the phrase "Err, excuse me?". There are lots of different people or creatures which you can talk to within the city.